life on board easy and pleasant. The Antares 30’s distinctive style is by Sarrazin Design. She has a classic look with taut lines and windows tinted grey. Her flybridge is particularly spacious, with a saloon, sunbathing area and a two driving stations on option. 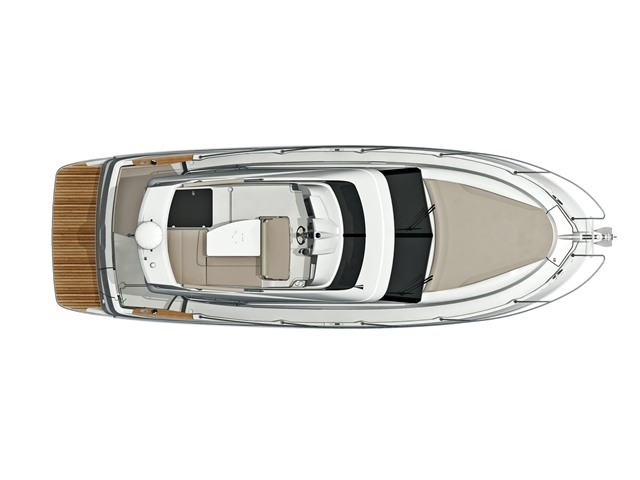 The grey-coloured hull of the latest “classic” edition is both stylish and chic. Timeless and elegant, the Antares 30 is a pleasure to drive on the open sea. 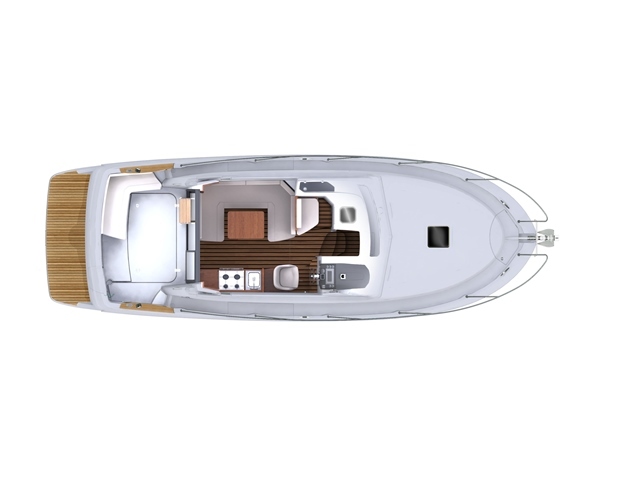 The Antares 30 has matchless living space and its fittings are very well-designed. The wheelhouse is large and bright, offering a panoramic view underway. The seat facing the sea means that you can share the joy of boating with the family or friends. Contemporary walnut wood and bright beige shades of upholstery create a pleasant interior ambiance. 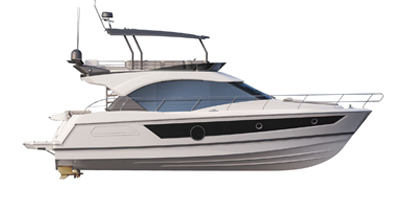 The Antares 30 stands out for the comfort she offers. Nothing can match her habitability, promising peaceful boating trips in complete safety. The Antares 30 has a fitted galley to starboard, including a laminated worktop, stainless steel sink, gas hob and oven, cutlery drawer, 65 L refrigerator and place to put the microwave oven. The owner’s cabin has lots of storage space, with a central bed on jacks, and it has a double sea view. The guest cabin has two bunk beds. To optimize the space, the upper berth can be folded away. The saloon converts into a double berth. The Antares 30 can easily accommodate 6 people on a cruise, offering the opportunity for some memorable moments together. An enormous forward sun-lounger is available on option. 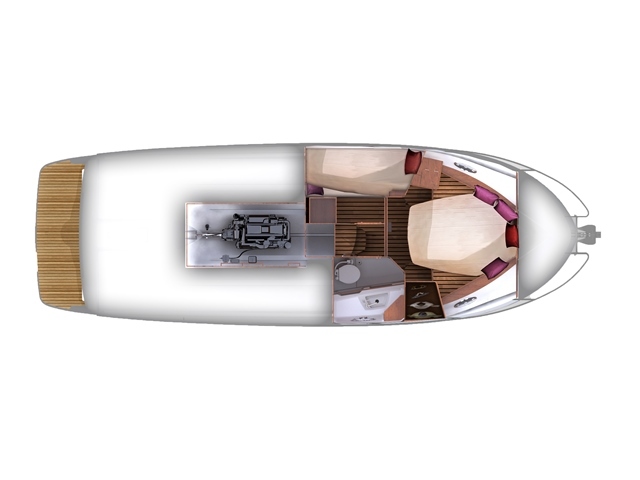 The pilot seat and saloon seats can be converted into a sun-lounger on the flybridge. The flybridge is a terrace with a panoramic view and two driving stations, but most of all it is a living space. The saloon has a U-shaped layout around a table. The access ladder has solid natural wood steps and a stainless steel structure. The whole of the flybridge is surrounded by a stainless steel pulpit to provide optimum safety. Saloon and flybridge driver's seat convert into a sun-lounger. Dual driving control on flybridge (option) with space for electronics. Volvo D6370 260 HP Diesel or Volvo D6 370 HP Diesel. U-shaped saloon converts into a double berth. 3-leaf sliding glass door to access cockpit. Driver station with bolster seat and "carbon look" control panel. Place for electronics and engine instruments. Large storage locker in cockpit. Owner's cabin: central bed 1.98 m x 1.4 m on jacks for optimal storage space. Guest cabin with 2 bunk beds and storage space. Bathroom: Marine toilet with integrated 88 L rigid tank, washbasin and shower. Opening hull porthole for ventilation.